Miami Trace’s Wyatt Cory (21) advances the ball up the field ahead of two players from Jackson during a Frontier Athletic Conference match Thursday, Sept. 13, 2018 at Miami Trace High School. 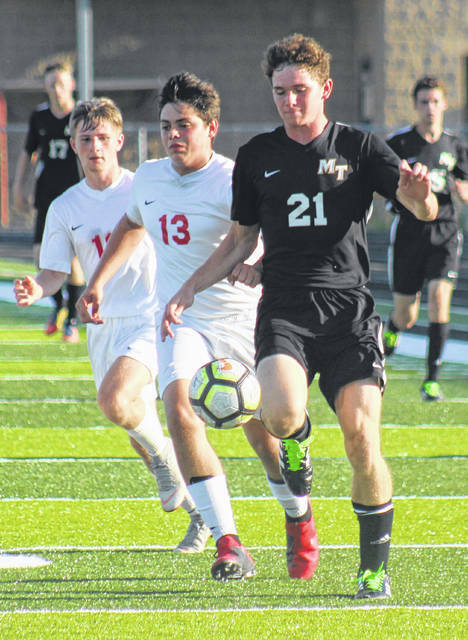 The Miami Trace Panthers varsity soccer team had a hard-fought match against visiting Jackson in the Frontier Athletic Conference Thursday evening. After a scoreless first half, Jackson scored about mid-way through the second half and held on for a 1-0 victory. Jackson improves to 4-0 in the FAC. They are tied with Chillicothe atop the FAC standings as the Cavaliers shut out Hillsboro Thursday, 6-0. Miami Trace is now 2-2 in the FAC, good for third place. Jackson scored the game’s only goal at the 20:35 mark of the second half. Miami Trace had six fouls in the game to eight for Jackson. The Panthers had 10 shots on goal to nine for the Iron Men. Justin Shoemaker had three saves for the Panthers. Jackson’s goal-keeper had seven saves. “There were a lot of shots off the mark,” Miami Trace head coach Josh Thoroman said. “I think what you saw was two evenly-matched teams tonight. Miami Trace (6-2-0 overall) will finish the first round of play in the FAC when they travel to Washington High School to take on the Blue Lions Tuesday at 5 p.m. The Blue Lions lost at home to McClain Thursday, 6-2.